While our schedule gave us a heads up that some new heroes were coming, I certainly didn’t expect this. Say hello to Ylgr, Surtr and Hrid, in the upcoming Fire and Ice banner. Of course, a new Paralogue comes with it, bringing forth orb quests and thus, more chances to summon one of these literal polar opposites. What’s unique about these opposites is their batch of skills, of which a couple if interesting looking A skills look inheritable, not to mention their rather potent looking weaponry. What’s also interesting is that this is the first banner since launch to only feature two Heroes. Fire and Ice, with its two Heroes and Paralogue chapters, kicks off on November 20 at 11p PT. Fans of the Japanese trailer can view it here. For more info on their Skills, click Read More. Grants Speed +3. At start of combat, if unit’s Spd > foe’s Spd, grants Atk/Spd +4 during combat. After combat, if unit attacked, inflicts Def/Res -7 on target and foes within 2 spaces of target through their next actions. At start of combat, if unit is adjacent to a magic ally, calculates damage using the lower of foe’s Def or Res. Grants Def +3. At start of turn, deals 20 damage to foes within 2 spaces. At start of turn, if unit is within 2 spaces of a foe, grants Atk/Spd/Def/Res +4 for 1 turn and inflicts Atk/Spd/Def/Res -4 on foes within 2 spaces through their next actions. He won’t be a legendary hero, because we just had Eirika last Month. Hrid’s not in this, just so you know. Though, I bet he’ll be GHB or Legendary unit now. On the bright side, fewer units means better chance of getting them. True, the problem I have with it is the precedent it might set – what if we get a Banner featuring only two Grey Units? I’m certainly not going to go digging through colorless hell to MAYBE get the wrong Featured Unit, especially not when there’s no Featured option for another color. The only upside I’m seeing to this Banner is that if I snipe Red I don’t have to worry about a Featured Unit getting in my way…if you can call that an upside. I don’t think that’ll be a problem. I don’t see this becoming the norm. I see this as a special case, as they clearly wanted to tie everything with Book 2 up before Book 3 came. They might as well have just given Surtr his skill that makes him impossible to damage. None of the Adrift banner got demoted. Well, what did you expect? 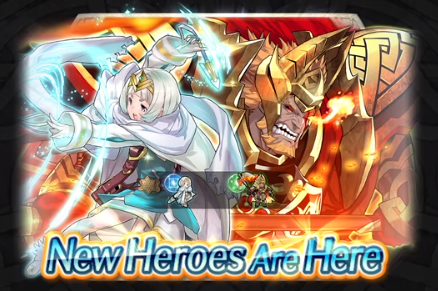 These New Heroes from the Adrift Banner are Special Heroes, and Special Heroes are never demoted, unless that Special Hero is a Tempest Trial reward, a 4-Star Special Hero from the Tempest Trial like Young Azura.